HelenKay Dimon spent the years before becoming a romance author as a...divorce attorney. Not the usual transition, she knows. The good news is she now writes full time and is much happier. 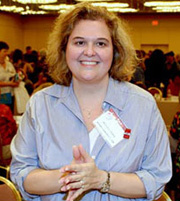 She has sold over thirty novels, novellas, and shorts to numerous publishers, including HarperCollins, Kensington, Harlequin, Penguin, Samhain, and Carina Press. Her nationally bestselling and award-winning books have been showcased in numerous venues. Her books have twice been named "Red-Hot Reads" and excerpted in Cosmopolitan. She is on the Board of Directors of the Romance Writers of America and teaches fiction writing at UC San Diego and MiraCosta College.